Police have apologised for the "hurt" they caused to two brothers arrested on suspicion of terrorism - one of whom was shot during the raid on their home. Mohammed Abdulkahar, 23, and Abul Koyair, 20, were arrested in the 2 June raid on their home in Forest Gate, east London, involving 250 officers. Both were later released without charge and have now spoken of the experience. Mr Abdulkahar, who was shot in the shoulder, said he had thought he was going to be killed by robbers. He said suing the police "is not even in our heads at the moment", adding he was more interested in an apology. "I want everyone that was involved, whoever gave the order for the raid to happen, for the shot to go off, everyone involved to apologise," he said. The apology was made by Assistant Commissioner Andy Hayman of the Metropolitan Police Specialist Operations after the brothers said they wanted an apology more than compensation. There was blood coming from my chest. I knew I was shot. Mr Abdulkahar said he only realised it was a police raid when he was allegedly dragged outside the house and saw police vans. Mr Hayman said: "I am aware that in mounting this operation we have caused disruption and inconvenience to many residents in Newham and more importantly those that reside at 46 and 48 Lansdowne Road. "I apologise for the hurt that we may have caused." Police searched the two properties but did not find the chemical device which "specific intelligence" had indicated was there. Mr Hayman said: "While we have not found evidence of what we were looking for at the house, the intelligence received did raise serious concerns for public safety. "On that basis we had no choice but to mount a robust operation, which required a fast armed response." He referred anyone with concerns about the raid to the Independent Police Complaints Commission which is investigating the shooting. Mr Hayman's statement came hours after a press conference in which Mr Kahar, often emotional, described being shot and his subsequent interrogation by police. The 23-year-old said he was in great pain when he was hospitalised after the shooting. He said he "had no idea" who spoke to the police, prompting the raid. 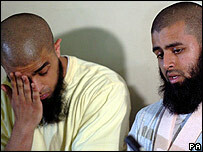 "From my point of view the person who did this they have terrorised me and my family," he said. "I thought one by one they're going to kill us. At that time I thought I was going to die." He described the moment when he was shot. "We both had eye contact, he shot me straight away," he said. "I just saw an orange spark and a big bang. I flew into the wall, slipped down. There was blood coming down my chest. I knew I was shot. "It's ruined my life from the day, from the time they entered my house. It's turned my life upside down." Mr Koyair also gave his version of what happened after the shooting. "No-one said nothing, I thought it was like a dream at first, no-one was speaking, saying anything. "After about one, two minutes I realised that this is not a dream. I realised that my own brother got shot for no reason." 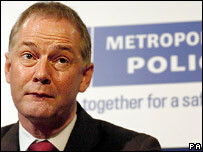 Metropolitan Police Authority member Murad Qureshi said the apology was welcomed. "The press conference was very emotional understandably, and one of the demands the brothers made, and they made it very clearly, was that they would like to hear an apology and that that was their overriding concern, rather than compensation. "So I welcome the statement made by Andy Hayman." Met Police Chief Superintendent Ali Dizaei said that while he had "grave concerns" about some of the allegations, people should reserve judgement until an inquiry was complete. Mr Ali Dizaei, a Muslim and a member of the Black Police Association, said the Met Police did "an extremely difficult job in a very extraordinary set of circumstances". "I think the majority of the community - particularly my own community, the Muslim community - that I talk to on a daily basis, actually appreciate that," he told BBC's Newsnight programme.